Newton, NJ – January 13, 2010. 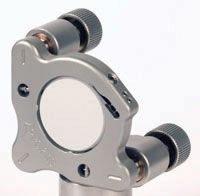 Thorlabs is pleased to introduce its Polaris™; Ultra Stable Kinematic Mirror Mount for Ø1" optics. To achieve industry leading stability performance, Thorlabs’ Polaris mirror mount is fabricated from heat-treated stainless steel, incorporates matched 100 TPI actuator and bushing pairs, and has sapphire seats at all contact points. Equally impressive is the mount’s price point – just shy of $100 – making it not only the best ultra stable mirror mount currently available on the market but also the least expensive. Some experimental setups, such as those that incorporate interferometers, external cavity lasers, or fiber coupling, can suffer dramatically from the vibrations and temperature fluctuations that naturally occur in any laboratory environment due to HVAC settings, the number of people in the room, and the on/off status of equipment. Experimental researchers are all too familiar with the scenario: spend hours optimizing an experiment one day only to find that it needs major tweaking the next day to reach the same level of optimization. These are the exact experimental setups that can dramatically benefit from the superior performance characteristics of the Polaris Ultra Stable Mirror Mount. Besides being manufactured to provide the stability necessary for alignment-sensitive applications, the Polaris mount is also designed for years of use in multiple setups. By using a flat-spring mechanism to secure the optic into place, the Polaris mount overcomes one of the drawbacks of other premium ultra-stable mounts, namely the need to glue the optic into position to achieve the best performance. Instead, the Polaris’ flat-spring mechanism provides sufficient holding force to keep the mirror locked into place regardless of the ambient temperature. By eliminating the need for glue, Ø1" optics can be easily swapped into and out of the Polaris mount as your experimental needs change. The Polaris mirror mount featured here is the first in a line of mounts that will minimize the maintenance requirements for precision optical systems. This mount will be among the new products demonstrated at Photonics West 2010. To learn more about these features and to view our extensive test data, please visit www.thorlabs.com/polaris. Thorlabs, an active member of the international Photonics community for 20 years, manufactures core and system-level equipment for the photonics industry, including optomechanics, optics, laser diodes, tunable lasers, optical detectors, motion control equipment, OCT, confocal, adaptive optics, and vibration isolation systems. As our community’s needs change, we are eager to bring new products to market that facilitate the adaptation of new ideas, technologies, and experimental techniques.